Got this from Hadoop Weekly, Issue #95, 9 November 2014. It has many other valuable articles on scaling. Watching programming language popularity is one of my hobbies. 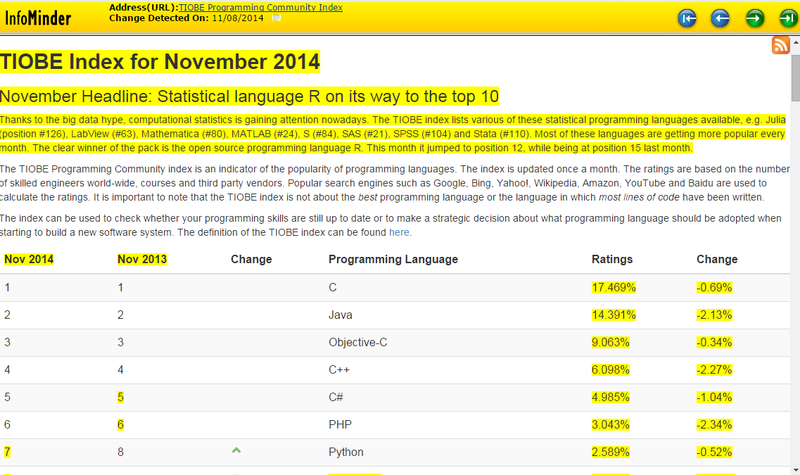 The TIOBE index Nov 2014, shows some interesting trends. Let us take a look. Click on these images to see a full page view. This para from the TIOBE is worth noting. Thanks to the big data hype, computational statistics is gaining attention nowadays. The TIOBE index lists various of these statistical programming languages available, e.g. Julia (position #126), LabView (#63), Mathematica (#80), MATLAB (#24), S (#84), SAS (#21), SPSS (#104) and Stata (#110). Most of these languages are getting more popular every month. The clear winner of the pack is the open source programming language R. This month it jumped to position 12, while being at position 15 last month. The top 7 languages (from a year ago) retain their spots, but all of them drop a bit in popularity. Dart, a programming language from Google, jumps into Top 20 from a previous rank of #81. Dart is language for building web and cloud apps. Swift comes from nowhere and enters #18 spot. Swift is a new programming language from Apple for iOS and OS X.
Perl and Visual Basic.NET stay in Top 10. It will be interesting to watch their moves. Watch the Top 50 languages (#21-#50). Some of them are leading indicators to future of computing. To see potential new entrants into Top 20, you may want to watch the other languages in Top 50 in the TIOBE site. I expected Scala to be in this list but for some reason, I don’t see it. I think it will soon move up into the Top 20 list. Three SQL dialects are still in Top 20. 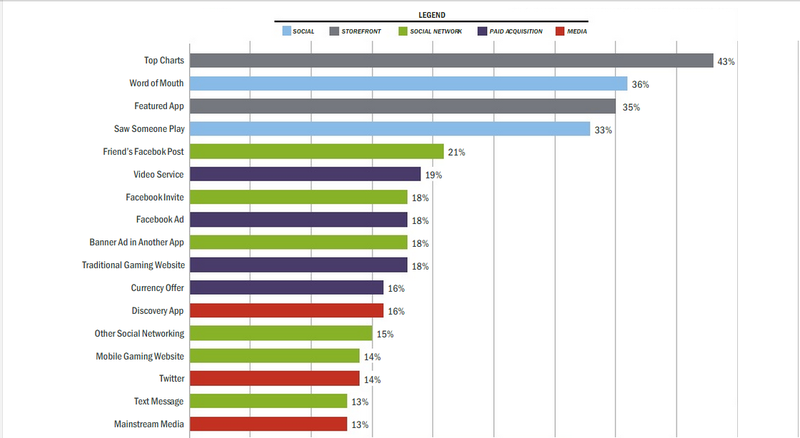 I am not surprised by that since SQL is still one of the most popular languages for database programming. I keep hearing a lot about Julia. I will be watching it with interest. The images in this page are from InfoMinder. InfoMinder is a tool for tracking web pages. I use it to track a few interesting pages on the web. When InfoMinder detects change in a page, it highlights it and creates a new changed page. It is one of the tools we built over a decade ago and is still chugging along, helping me and others watch the web. It is always nice to see when some one leaves a big pay check, a prestigious job with one of world’s biggest companies and ventures out into the unknown. It takes a lot of conviction, grit and perseverance to make it. Nest Co-Founder Matt Rogers explains why careers can be made on taking on the challenges and projects unloved by others. A few notes from one of the most inspiring startup stories. Growing up with technology at a young age changes your mindset and how you interact with the world. Doing end to end in technology is really complicated. The best teams are the ones with a culture that gets going when things go wrong. For startups, PR is the best means of early marketing. Growth metrics are very different for physical items. For apps it may be downloads in millions. For physical items, a few sales from each store is good. The early stages of a startup are fun but may be very glamorous – lots of market research, cold calling, talking to people to hire, white boarding, sketching, prototyping, brainstorming, trying out different things and building. To be a good startup, you need to have an intentional processes, deep technological integration and great design. You need to build things that are really easy to use. I enjoy listening to ETL (Entrepreneur Thought Leaders) podcasts. They normally get good speakers and the audience ask great questions. I hope you enjoy this podcast as much as I did. How Much should You Know About Computing? How much should you know about computing, if you are not a software developer? In his podcast titled To Code or Not to Code, Grady discusses how much a functioning member of society today should know about computing. Knowledge and understanding have a funny way of expanding. Thinking computationally? What does that mean? Why is that important? Computational Thinking (CT) is a problem solving method that uses computer science techniques. The term computational thinking was first used by Seymour Papert in 1996. So what is Computational Thinking? Well it is a collection of diverse skills to do with problem solving that result from studying the nature of computation. It includes some obviously important skills that most subjects help develop, like creativity, ability to explain and team work. It also consists of some very specific problem solving skills such as the ability to think logically, algorithmically and recursively. It is also about understanding people. Computer Science is unique in the way it brings all these diverse skills together. So back to the original question – how much should you know about computing? It depends. Students should know “computational thinking” since it will help them build problem solving skills. Not every one needs to be a programmer but learning a simple language will give them a chance to appreciate thinking like a programmer. The essential skill one need to acquire is to take a complex problem, break it into simpler/manageable problems and apply existing knowledge to solve the simple problems. To find patterns (some level of abstract thinking) to apply solutions from one domain to an entirely different domain. What do you think? Do you think Computational Thinking is an essential basic skill?